In-n-Out Burger has been sued by a man who alleges he found meth in the bottom of his drink, according to a lawsuit filed in Los Angeles. The incident allegedly occurred on the night of March 9, 2014, when Fred Maldonado, of Carlsbad, ordered a burger and drink from a Southern California In-n-Out. An executive for the restaurant chain has called the claim "baseless." Maldonado then returned to his nearby motel, where he drank half the beverage and went to sleep. When he awoke the next morning, he emptied the rest of the drink and allegedly found two pills and a napkin at the bottom of the cup, according to the lawsuit filed in the Los Angeles Superior Court. 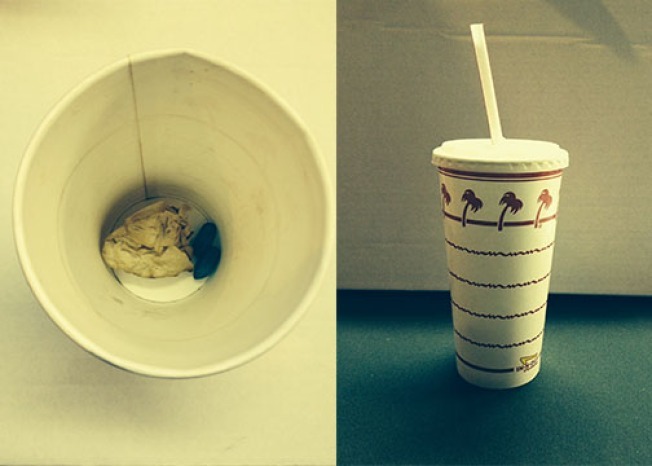 When Maldonado returned the cup and its contents to the In-n-Out location, located at 8767 Firestone Blvd. in Downey, the manager apologized and offered him a gift certificate for a free burger, according to the lawsuit. Though Maldonado was unaware of what the blue gelatin capsules were at the time, later testing found that they contained methamphetamine, according to toxicology findings from last August submitted by Maldonado's lawyer, G. Patrick Connors III. The napkin and the cup both tested negative for methamphetamine in a test conducted by Utica Toxicology Service. "The beverage served by defendants to plaintiff was not clean, wholesome, and free from harmful or injurious foreign substances but instead, unknown to plaintiff, contained hazardous and unhealthful foreign substances, namely two capsules of methampetamine and a napkin that was unfit for human consumption," the lawsuit stated. A picture of the capsules and napkin allegedly found in the drink were provided by Connors. Maldonado did not ingest the pills, but did suffer nausea and serious injuries to his health, as well as mental distress, as a result of consuming the drink, according to his lawyer. In-n-Out has denied the allegations. “At In-N-Out Burger, we have always served the freshest, highest quality burgers, fries, and drinks and customer safety is one of our highest priorities. We will vigorously defend these baseless claims. Due to the fact that this matter involves ongoing litigation, we will unfortunately not be able to comment any further,” In-n-Out Executive Vice-President Arnie Wensinger said. Maldonado has sued for unspecified damages.